I handed my paycheck to the teller and asked her how much money I had in my savings and checking accounts. “$573.32,” she responded. I asked her to cash my entire paycheck and went to work on a bank slip. A few minutes later, I walked out of the bank with $1,679.56 stuffed into the front pockets of my jeans. Once I got into my car, I stacked the cash on top of my dashboard and stared at it for a few moments. The stack stared back at me and I no longer knew if I was making the right decision. I didn’t let myself ponder for long, because I didn’t trust myself with that money and a plane ticket to the furthest possible place from Saint Paul was a much better decision than all the alternatives. Most maps included Reunion Island as a spec that could easily be mistaken for a mismarking the printer’s ink caused and from what I read about Reunion’s history, it seemed like the island was a place a lot of people wished was an accidental mark on the map. Its history was one mess after the other, so at the very least, we had something in common. Over the next few days when I told friends and family that I was going to the end of the earth, my irrational decision didn’t shock them like I thought it would. They simply asked why in a tone that was tired of asking why. I acted nonchalant and said that I was in need of a vacation. We all knew I was running away from a drinking problem and broken relationships. Mostly, I was running away from myself with the hope that somewhere at the end of the earth there was a better half and I would find that side of me, embrace it and when I got back to Saint Paul a few months later, I’d be that better side of me. I knew how foolish my thinking was and I didn’t feel good about involving my girlfriend Martha in all of it, but I was desperate and us being on Reunion Island was the last bit of hope I had in my head. We were supposed to be in love, but those may have been the words I needed to convince myself of in order to make the trip happen. Then again, she wasn’t some desperate sap who needed someone to need her. She was going to get her PhD after we left the island, so she must have loved me and I must have loved her or at least loved her for loving me. I wasn’t sure how it all added up and I didn’t really care. I was simply glad to be running away. 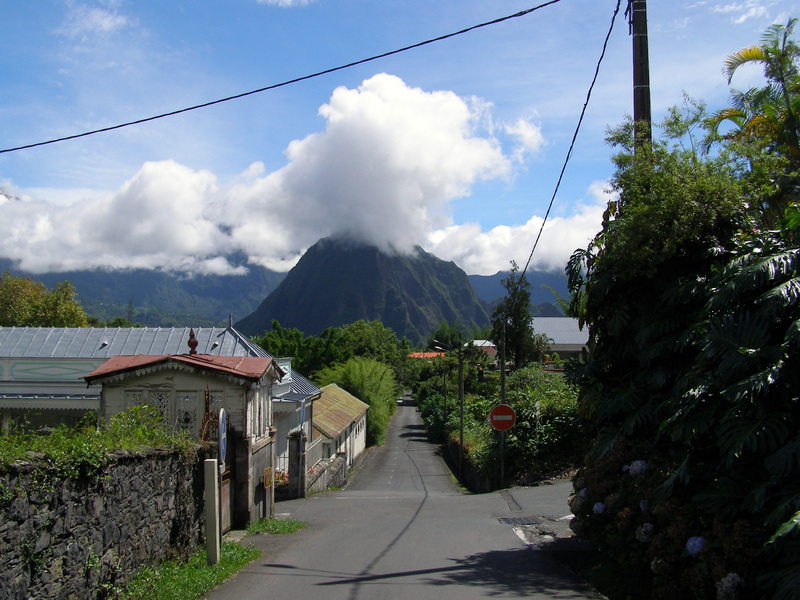 After three time zone changes and four different flights, I was on Reunion Island. My first thought was that I had just stepped onto a movie studio lot and they were filming a movie in paradise. Mountains surrounded me and the roar of the ocean was within reach. Palm trees swayed in the way you’d expect them to in paradise. The blue of the sky covered every square inch of visible space and not even a millimeter of it held a cloud. I watched the sky pour down over a steep set of mountains and merge seamlessly with the ocean’s blue waters. I looked out to the ocean, trying to figure out where the sky ended and the ocean started, but blues blended and I couldn’t believe Reunion was real. I couldn’t believe that stack of cash turned into a place that looked like paradise. Kevin Finley holds an MFA from Saint Mary’s College of California and has been working as a book publicist for several years. He blogs at www.businesssideofbooks.com and is currently shopping his travel memoir GOODNIGHT SAINT PAUL.